It has taken me far too long to write this review! So, let's get on with it! Rice Terraces is a fairly new restaurant and as far as I know, the only Filipino restaurant in Edinburgh (and the whole of Scotland?). During my time in Japan, I made had many Filipino friends and I remember how fondly they talked about their (pork) food but as none of them were big cookers, I never got to try anything Filipino. With this in mind, I headed to Rice Terraces with an ignorant but excited mind. The restaurant itself is tucked away in a fairly quiet back street in Edinburgh's south side, but if you know the area it's not hard to find. It's essentially opposite Homebase (free parking anyone?). The restaurant it not too big, about 25 people max, and the decoration is simple but pleasant enough. A word of warning, the bathroom is cold! As I said, I have no idea about Filipino food beyond the basics (adobo, lechon and polvorón being about the extent of my knowledge) but luckily the staff (a family affair, by the way) are friendly and are happy to explain about their food and make recommendations. The waiting staff all seem very proud of their food, which is a nice sign. I decided to go for a starter, main and dessert and with a little help from my server chose Lumpiang Sariwa, a spicy pork dish that I forgot the name of (opps) with a side of rice, and Ube Halayan. To drink I had mango juice and plenty of water. All of my dishes arrived in good time and the service from the waiters was attentive and friendly. On to the food! 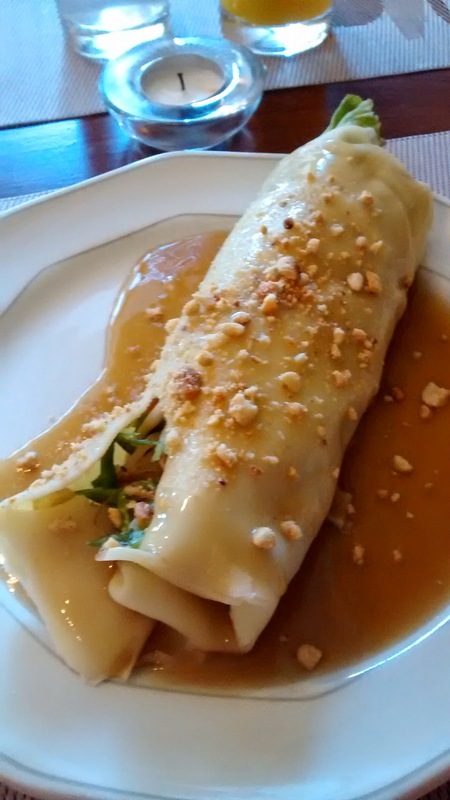 My starter, Lumpiang Sariwa, was certainly larger than I expected! It also tasted completely different than I expected! it was like a thick pancake, covered in crushed peanut and filled with bean sprouts and other veggies. Occasionally I get a kick of black pepper where someone hadn't mixed properly, but otherwise the filling was good and the pancake was good overall. The veggies in the middle were tasty and fresh and the overall experience was a good one. The peanut and garlic sauce was delicious but I could have done with more of it! Not enough gravy is a crime. I have forgotten the name of my main dish, apologies, as it was on the list of specials, all of which sounded delicious! My dish came to my table sizzling hot, and I was asked if I wanted a fresh egg cracked and scrambled on my dish, which I most certainly did! This is optional. The dish consisted of (deep-fried?) pork cubes in a smokey, peppery gravy. This dish was apparently spicy, but I have an extremely high tolerance to spice and say this was about... a 7 out of 10? But don't trust me because I love spicy food... The dish was good, but I wouldn't order it again, if I'm honest. It was a little too heavy for me, and although the dish had good flavour, as a stand-alone main (with rice) it can become a little same-y. There are many other wonderful sounding mains at this restaurant that I would rather try! As for my dessert, well, this was called a soufflé but it most certainly is not! 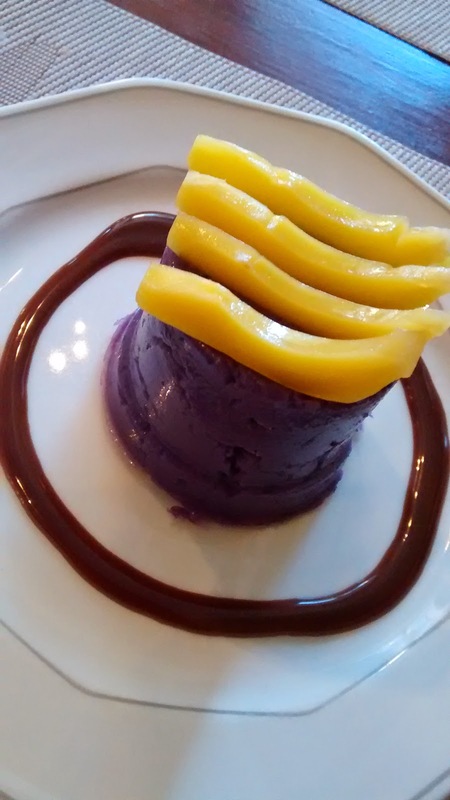 Ube Halayan is a very heavy, thick dessert made of ube, a delicious purple tuber, and coconut. There was a delicious caramel/chocolate sauce around the outside, but again this was in short supply! I must warn you that this is a very heavy dessert, and best shared! The texture is like a very thick mousse, and the flavour is of mild coconut and ube (uhm, duhh). I can't say I loved it, but I think if I had someone to share it with, or had eaten a lighter meal beforehand I would have enjoyed this. It was freshly made, which I appreciate. My overall experience at Rice Terraces was good, and I certainly recommend anyone to try this restaurant! 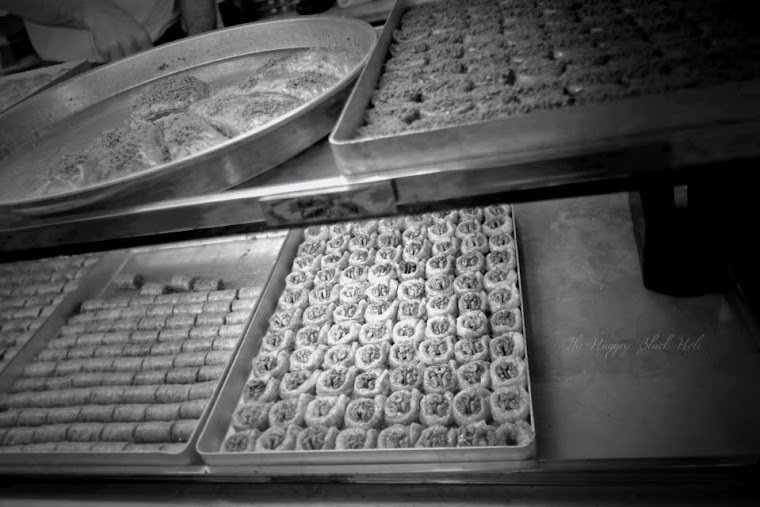 The portions are huge, the food is freshly and lovingly made, the service is friendly and the price is fair! However, I recommend this as a place to visit with family or friends where you can order a wide variety of dishes and enjoy many different flavours and textures. For me, I don't think I ordered the best dished for my tastebuds, but I will certainly be back to give it another try! 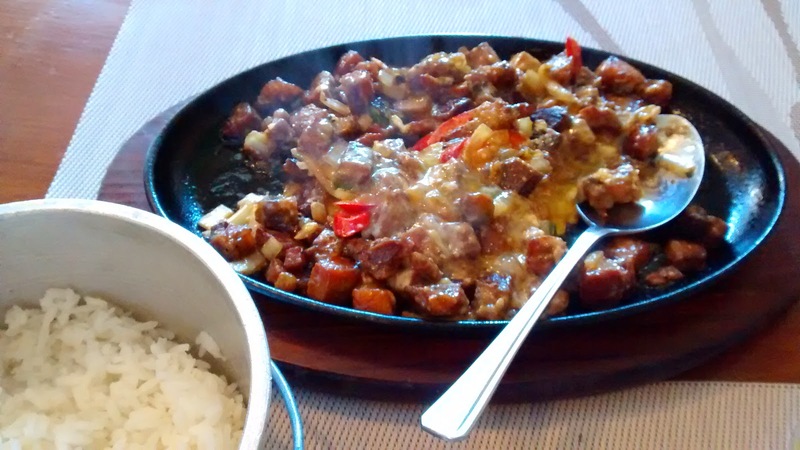 For a nice list of Filipino food, please see here.